You need to use a secondary boot drive in order to install a recovery partition to your main drive. The reason for this is because dmtest is unable to write anything to your boot drive now. Download the latest recovery script here. Download Mac OS High Sierra from the app store. Open the recovery.sh script in TextEdit. Change the TARGET and MACOS_INSTALLER fields inside the script to match the volume and path you want to install a recovery partition to and where the script can find the Mac OS X High Sierra installer. The High Sierra installer is likely on your main drive so just point to that path. Save the script after. Run the recovery.sh in terminal with sudo. After the script completes, you will have a recovery partition created. You can check for it in Disk Utility. In this guide, we will update a Mac’s old recovery partition (10.7 Lion or younger) to Mac OS High Sierra 10.13.5. 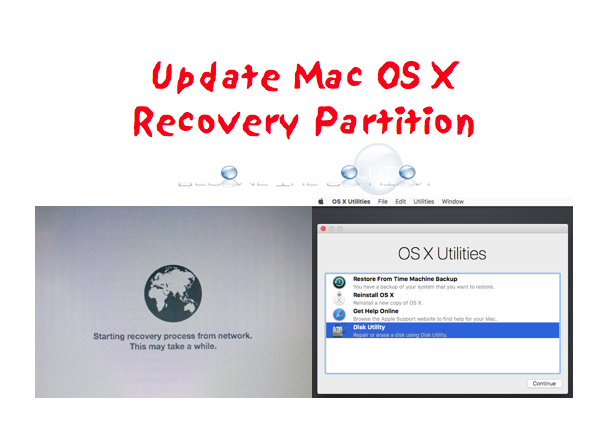 Mac OS does not automatically update the recovery partition on Apple computers when you update the OS or re-install a new copy of the OS. This can be frustrating in certain circumstances. For example, the 10.7 recovery partition does not include the same Terminal bash commands as High Sierra, such as csrutil. Is created by default when you install Mac OS X for the first time. This boots to Internet Recovery mode and will only grab the version of Mac OS X that originally shipped with the Mac. This is behavior controlled by the Apple servers and you will not be able to change the Internet recovery re-install image unless Apple decides too. This means if you re-install Mac OS Lion 10.7 on a Mac that shipped with 10.7 and decide to upgrade to High Sierra, you will still have the Lion 10.7 Internet Recovery image. The exception are the Macs that originally shipped with a recovery DVD prior to Lion, or earlier Macs that lack the firmware update to boot into Internet Recovery. On some older Mac’s, Internet recovery is done with key combo shift + option + command ⌘ + r.
In this case, we will update the recovery partition on our MacBook Pro 2011 from the default 10.7 Lion recovery partition to the High Sierra recovery partition 10.13.6. Download the latest Mac OS High Sierra installation from the App Store. After downloading, right-click the installation file (located inside Applications) and choose show package contents. Browse to Contents/SharedSupport and copy InstallESD.dmg to your Mac user Downloads folder. 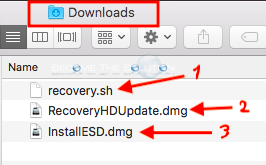 Download recovery.zip here, unzip it, and place the recovery.sh file in your Mac user Downloads folder. 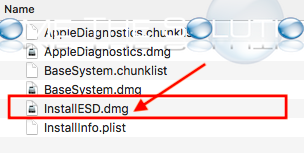 Verify your 3 files are inside your user home Downloads folder – recovery.sh, RecoveryHDUpdate.dmg, InstallESD.dmg. Open Terminal (Applications -> Utilities) and type the following commands. Verify you see Creating recovery partition: finished message. Don’t worry about the other messages displayed – including the common last line below. It can be safely ignored! Test your new recovery partition. Reboot and hold down Command ⌘ + R.
Finally, the only other recovery option available is to install Mac OS High Sierra on a bootable drive (USB or portable drive) using Install Disk Creator.